contrasts sharply with the light greens and yellows of encircling prairie grasses." 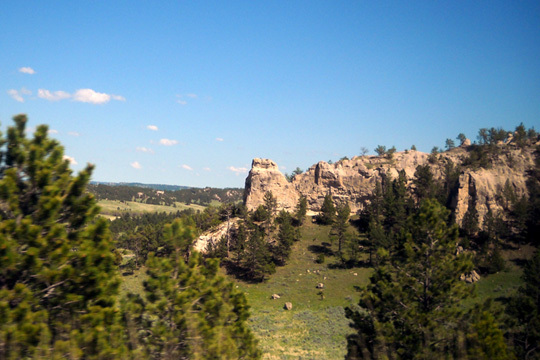 The Black Hills National Forest covers 1.2 million acres of land, mostly in southwestern South Dakota. It also extends into eastern Wyoming a little bit. 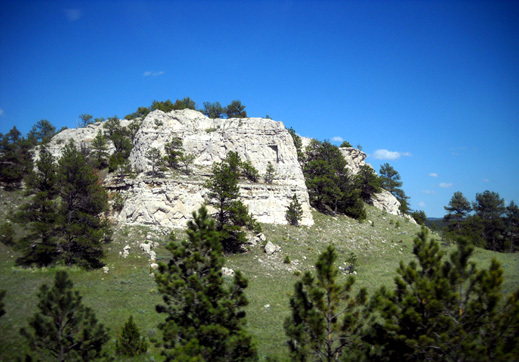 In addition, there are thousands more acres comprising Custer State Park, Wind Cave National Park, Jewel Cave National Monument, Mount Rushmore National Monument, and the small towns of Lead, Deadwood, Silver City, Custer, Keystone, and others. 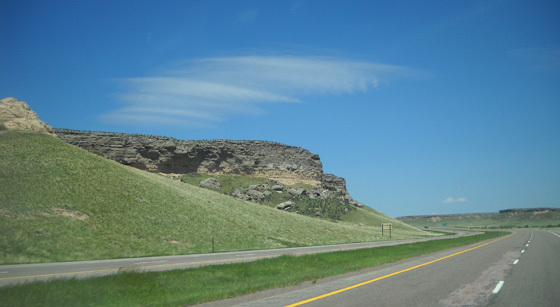 This big green area on maps is full of scenic byways with hairpin turns and narrow tunnels, historic towns and architecture, legendary outlaws and other characters, a variety of museums, arts centers, and shops, a replica of a 12th century Norwegian chapel, a mammoth site, old mines and gold panning, Mount Rushmore and Crazy Horse memorials, hot springs, unusual natural rock formations, rugged canyons, unique caves and caverns, a petrified forest, the highest peak east of the Rockies, rushing streams and waterfalls, extensive trails, lots of wildlife from prairie dogs to mountain lions, bighorn sheep, mountain goats, elk, bears, and bison, a huge buffalo roundup, and numerous recreational opportunities . 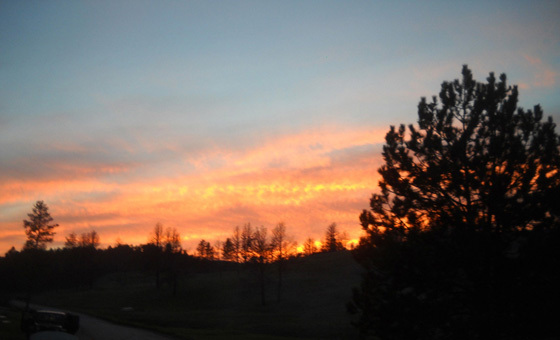 . .
That's just a start of what you can see and do in the Black Hills area. I haven't mentioned all the gambling establishments, the large motorcycle rally in Sturgis (we're talking hundreds of thousands of motorcyclists in the area in early August), and many tourist attractions. There's something in the Black Hills area to keep just about anyone busy for at least a few days. We are most interested in the scenery and trails. The Black Hills are literally and figuratively a cool place and that's why we'll be here for about a week. That, and some business we need to do in Rapid City, the location of our mailing service. Here's our plan and how we got here. This morning we left the USAF Academy bound for South Dakota. It was just a one-day trip for us. 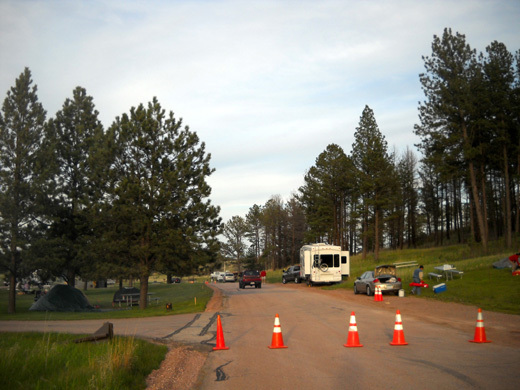 Plan A was to camp for two nights at Wind Cave National Park in the southeastern part of the Black Hills. We couldn't make reservations there, however, so if there wasn't a suitable spot for us when we arrived this afternoon Plan B was to continue on to Ellsworth AFB east of Rapid City, another 90 minutes north. We had a Plan C, also, because we couldn't make reservations at Ellsworth either! Our mailing service now has a new building and some campsites for customers since most of its clients are full-time RVers. We lucked out and got the last spot at Wind Cave NP that was large enough for our camper. The next two or three entries will be reports from our adventures in the park. 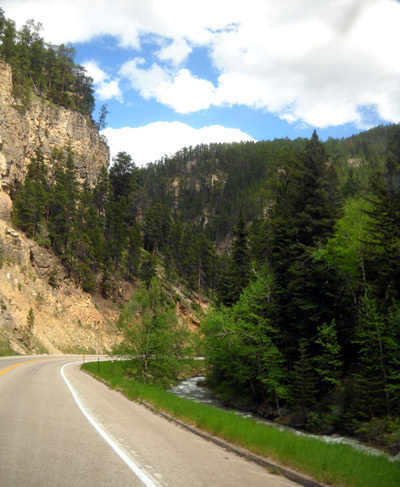 This entry focuses on the drive from the Academy to Wind Cave from the perspective of hauling or driving an RV but much of the information is relevant to drivers of other vehicles, too. If you aren't interested in routes, road conditions, rest areas, etc. just scroll down through the photos (including bison) and hit "next" at the bottom for more information about the national park. We exited the USAF Academy at the north gate, which is at exit 156 on I-25 north of Colorado Springs. Although there is major bridge construction on Academy Drive between the campground and the north gate there was adequate room to get our camper through. The construction will probably take all summer. It caused us more grief when we were cycling through it than when we left in the RV. 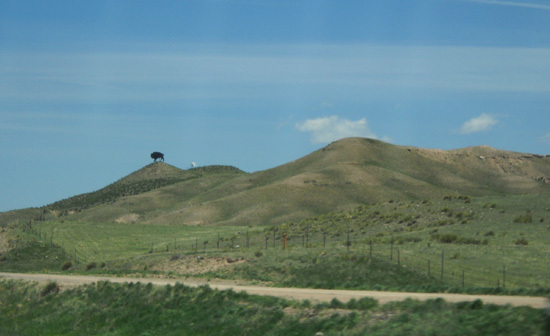 Along I-25 in Wyoming; this area is very green even for springtime (in the summer, it's brown). There are several turns in Hot Springs to go to Wind Cave, so pay attention through town if you're driving or hauling a large RV. These highways are all fine for RVs. 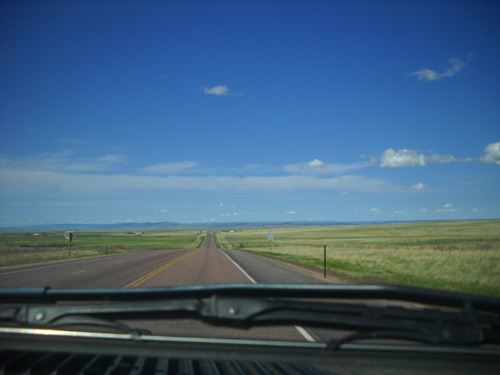 The two-lane roads in WY and SD were hilly but good, with fairly easy passing even when there weren't passing lanes. We left the Academy late enough this morning (9:15) to avoid rush hour traffic through both Colorado Springs and Denver. Traffic was heavy in both directions between the two cities but it moved well except for about two miles through southern Denver where a combination of road construction, a vehicle wreck, and merging traffic fouled up traffic for a little while. Look -- there's a bison on the hill! Oops, just a metal one to get the kids all excited! Traffic remained heavy through the urbanized Front Range area north of Denver on I-25 until we were past Fort Collins, almost to the Wyoming border. We were able to drive 60-62 MPH most of the way through this area, however. We saw lots of southbound RVs along the entire route. Others were headed north to the Black Hills or Badlands but since we were also going in that direction, we didn't see as many NOBO camping rigs. This route is hillier than you might think since we were east of the Rocky Mountains all day. Going north we had a net decrease in elevation. We started at about 6,700 feet at the Academy, went up to 7,352 feet at Monument (just north of Colorado Springs), were about 5,200 feet in Denver, and ended up at about 4,600 feet at the campground in Wind Cave NP. Our fuel mileage hauling the Cameo ranged from 16+ MPG on more downhill segments to an average of 12+ MPG through hillier sections when we were roller-coastering up and down. We've stopped at exit 7 in Cheyenne many times for fuel on previous trips on I-25 or I-80, usually at Flying J. Since we no longer have a FJ card and they aren't as RV-friendly as they were before merging with Pilot, we sought out a different truck station this time. There are several choices at this exit. Shamrock had diesel for less than FJ or Loves so we fueled up there. Ingress/egress is easier than at FJ, too. The secret when you're in a large RV is to go in the second entrance, not the first, so you're aimed right for the angled pump lines in the rear of the store. We learned that the hard way the last time we were here . . . Cost of diesel was $3.85/gallon today. The Shamrock station also has a Subway, so Jim was able to get lunch there. The only downside to the Shamrock station is having to go inside with your credit card, then retrieving it and your receipt afterwards. At least it didn't have a $75 or $100 limit like we sometimes encounter when we do the entire credit card transaction at the pump. It seems like there's always some inconvenience when we get fuel with the camper. I don't think any of the rest areas in Colorado or Wyoming on this route were closed today. We stopped at two nice rest areas on I-25 in Wyoming to change drivers, go to the bathroom, let Cody out, etc. : MM 54 and MM 126, which is where we got off the freeway and onto US 18/20. The rest area at MM 54 has a free dump station for RVers. That's always a convenient touch. I didn't pay much attention to the location of Walmart stores today because we weren't planning to stop overnight along the way, but I did notice a big, new Walmart on the east side of I-25 at Harmony Road in the Ft. Collins, CO vicinity. I believe it's exit 265. There is a sign for Walmart going northbound on the freeway, which is very unusual. The parking area looked large enough to accommodate several RVs. I don't know if RV parking is allowed there, however. There is a Walmart on the west side of the freeway in Ft. Collins or Loveland that did NOT allow RV parking when we wanted to stay there several years ago -- not the store's fault, but a local ordinance no doubt perpetrated by private campgrounds that were losing money. I don't know if that ordinance still exists, and I don't know if RVs can park overnight at the new store near Ft. Collins. In recent years when we've wanted to stay in that area for one night we've parked at the Sam's Club or Walmart in Longmont, several miles south of Ft. Collins and Loveland. The stores are 3-4 miles west of the freeway at exit 234. We have traveled this route before and always enjoy the mountains and other scenery. 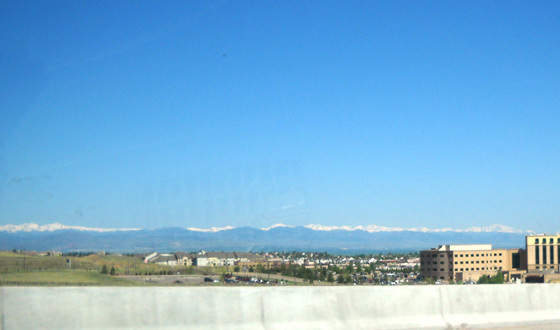 View of the Continental Divide from Denver; look at all that snow at the end of May! 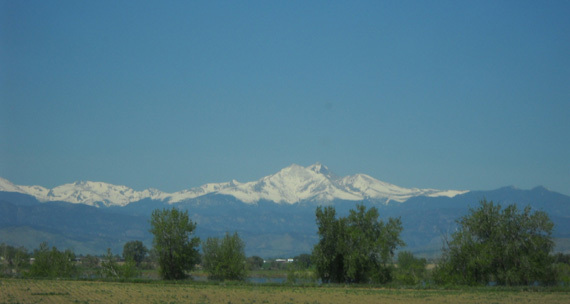 We could see a lot of snow on the Front Range peaks for many miles in Colorado -- the Mt. Evans Wilderness Area, Rocky Mountain National Park, and points in between. These ridges form part of the Continental Divide and they are high enough to still retain a bunch of the excess snow that fell this season. I think Rocky Mountain NP is still closed; it usually opens by Memorial Day but there's still a ton of snow in the park. Wouldn't that be a nice view to have from your back yard? Last May when we drove up to the summit of Pike's Peak the Continental Divide looked very cool with all the snow-covered peaks to the west. If we'd done that this year, the mountains would have looked even better with the higher snow pack. Too late now. When we return in July most of the snow will probably be gone. The last day of May, however, and there's still all this snow . . .
From what we've read, it's even deeper and at lower elevations farther north in Wyoming and Montana. That's why we headed to South Dakota this week instead of the Bighorn Mountains. In Wyoming this afternoon we drove farther from the mountains but were treated to some of the greenest rangeland we've ever seen there. That's because of all the rain this spring. In dry years the range is already turning gold and brown by now. With the bright blue sky, some red roads, and the green grass . . . Wyoming is even more colorful than more-dry Colorful Colorado right now. 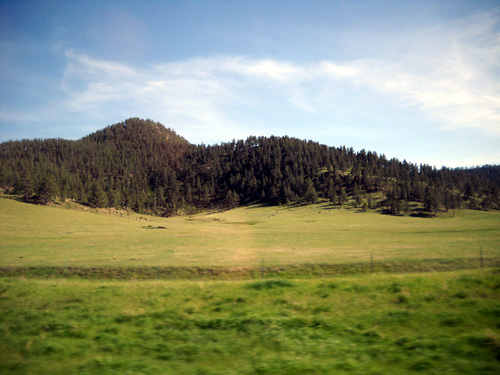 Soon we came to the Black Hills, which offer a different kind of beauty. This was only our second time in Hot Springs and the first we've headed north from there to Wind Cave. As mentioned earlier, we had several turns to make but we managed to get through this popular tourist area without having to turn around or backtrack on any narrow streets. Wind Cave NP is just a few miles north of Hot Springs. The terrain is hilly and scenic. 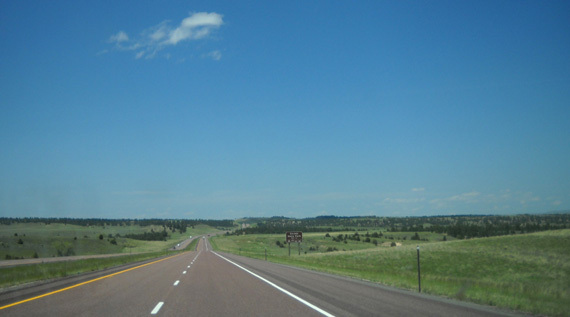 US 385 bisects the park from southeast to northwest. There is no entry fee to drive through the park or use the trails, which is nice. 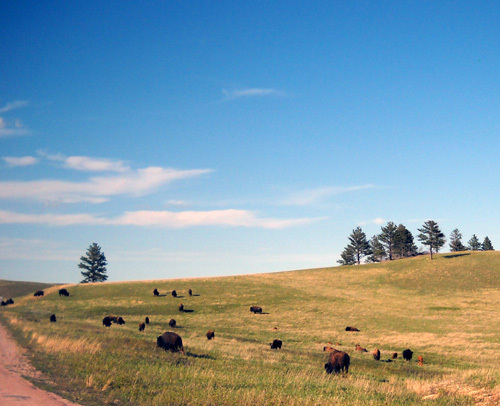 Although there aren't as many bison in Wind Cave NP as there are in Custer SP, we saw some buffalo grazing right along the road just about as soon as we entered Wind Cave. 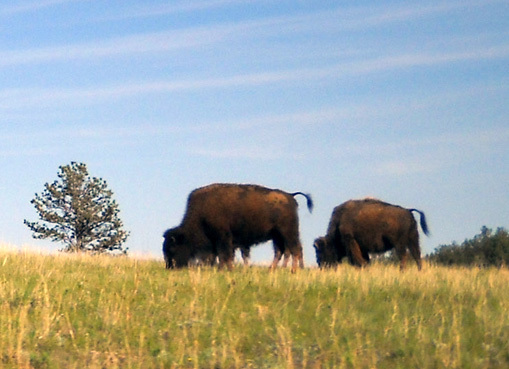 These are pretty much "free-ranging" bison, although there are fences here and there to keep them contained within the park and not in the campgrounds, near the cave entrance, etc. We have a nice view from our door side up the hill, where we spotted three deer feeding in the woods about 50 feet away this evening. I'll talk more about the campground and park in the next entry. We plan to stay here for two nights, then move to Ellsworth AFB east of Rapid City before the weekend crowd arrives there.